1) Shop the sale! 20% of every purchase on Empire.Kred will go to the Feline Foundation of Greater Washington (FFGW) to help this all-volunteer group save kittens. 2) Pick a badge to sponsor a kitten. 70% of each kitten/cat badge purchase will go to FFGW during this event. Pick kitten, cat, or litter badges to help sponsor kittens, or pick a badge to honor your cats. 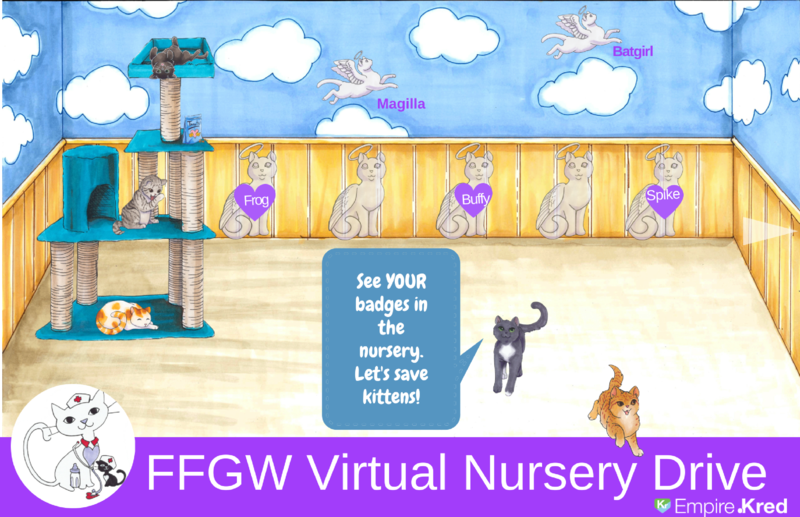 Let's fill the nursery up with virtual kitties in order to save REAL kitties. 4) Throw kitten jingleballs to give fellow players 100,000 eaves AND help save even more kittens. April is kitten season… and that means litters of kittens flood into shelters and rescue groups. People think they should take kittens to a shelter, but it is the absolute worst place for them due to the diseases and the constant care babies need. That’s why rescue groups like the Feline Foundation focus on getting Moms and kittens out of shelters (and dumpsters and other at-risk locations) and into foster homes. Foster parents (like (e)OMDIRECT) then raise the kittens until they are 8-12 weeks old. FFGW then finds homes for the kittens (and Mom) by running adoption fairs and showcasing kittens at their PetSmart adoption center. Every kitten costs a minimum of $100 in vet and other fees. Healthy mothers cost at least $250 to vet and spay. That means that an average litter of 4 kittens costs $650 to save. Of course, not every Mom and kitten is healthy, so extra funds are needed to handle special cases. PLEASE STOCK UP ON PIE, EAVES, AND ALL THE UPGRADES YOU’LL NEED THIS MONTH. Remember [X]PendaPalooza is coming soon, so this is great time to stock up. 20% of every dollar spent will go to save kittens. 70% of every FFGW badge will go to save kittens during this event, so check out the new Save Kittens badges supplied by the Feline Foundation.